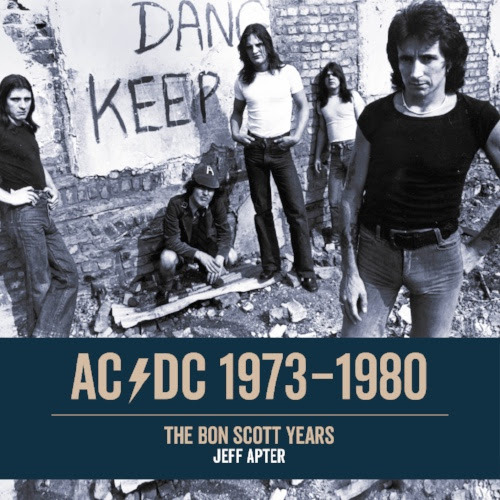 Jeff Apter knows a little something about AC/DC. In addition to ghostwriting bassist Mark Evan’s memoir Dirty Deeds: My Life Inside and Outside of AC/DC and former manager Michael Browning’s Dog Eat Dog: A Story of Survival, Struggle, and Triumph by the Man Who Put AC/DC on the World Stage, he also authored High Voltage: The Life of Angus Young, AC/DC’s Last Man Standing. Perhaps it shouldn’t be surprising that he has more to offer on the subject. AC/DC 1973-1980: The Bon Scott Years is 256 pages, stuffed with rare photographs and memorabilia, that traces this incomparable era of the band. Indeed, the band produced 6 albums in this 8-year stretch, including timeless cuts like “Dirty Deeds,” “If You Want Blood,” and “Whole Lotta Rosie,” to name a few. Within these pages, the book starts with the band’s very first gig and ends at the untimely death of Scott. What lies between is more than just a history of the band, but a summation of the essence of rock n’ roll. Following an introduction and a chapter on the bands early years, the book is comprised of a single chapter for each year from 1973 to 1980. Within each chapter, Apter marks the month (sometimes the exact date) of notable gigs, appearances, releases, and of course, the controversy the band generated at the time. Filled with quotes by members of the band, and those associated with them in one way or another, the book is less of a straight ahead run through a timeline, but almost an oral history of the era. It’s one of the qualities that elevates the book above mere research. Another of these qualities is found in the rare photographs. These photos bring to life this era of the band, whether they are live shots or candid moments caught behind the scenes. Gig posters, album and single covers, and promo shots also add depth to the history as the reader follows the band from year to year. But, it’s the stories that really make this book so great. If you’re not a fan who has read everything ever written about the band, this volume is chock full of fascinating stories and funny anecdotes. And even if you are a fan who has more than one AC/DC book on your shelf, doubtless there’s some information here you haven’t previously unearthed. But, this book shouldn’t be pigeonholed into something strictly for AC/DC fans, rather it’s a book that all those interested in the history of rock n’ roll should read. Considering there hasn’t been anything resembling a rock star in recent years, this era of AC/DC is a reminder of what being a rock star is all about: subverting the standards of music fans, journalists, and innocent bystanders, cutting against the grain of what society considers tasteful, and most importantly, creating music that is inherently exciting and reckless. What better example of this can be found than in the Bon Scott years? This is a book every AC/DC fan will cherish. It’s not a coffee table book, but you may as well leave it there as it begs to be revisited frequently.